To understand the tree, we have to start by asking what a tree is. A trunk, branches, roots, foliage … and the next question, one any child just naturally asks, is: Why? Why do tree trunks get bigger all the time? Why do they raise their leaves farther and farther up into the sky? Why do their roots seem to spread all over the place underground for some reason only they know? The answers can be found by looking at where trees grow. And those answers are all around us: in the water we drink, in the sun that warms us, in the soil that feeds us. The tree as an individual. 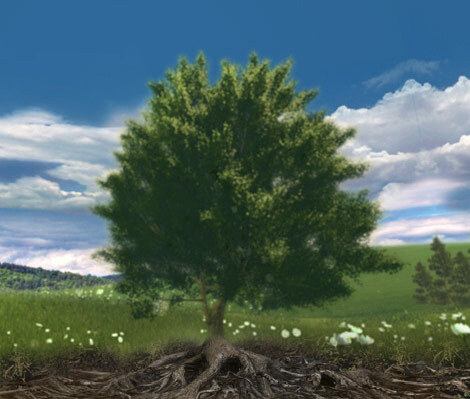 The tree as a community of interdependent cells. The tree as a tiny part of the forest. We can look at the tree in many different ways, from the infinitely small cell to the immense forest ecosystem, but the fact remains: the tree is intimately connected to its surroundings. The tree interacts with its environment. And what does that mean, exactly? Read on and find out!